We are a home based kennel situated in Callander, Ontario just south of North Bay. Only 180 minutes north of Toronto. We only breed English-type Golden Retrievers with clearances for hips, heart and eyes. The dogs we breed must also have the true Golden Retriever temperament: calm, eager to please and to retrieve and a fun loving companion. All our dogs are first and foremost great family pets and all live in our home. 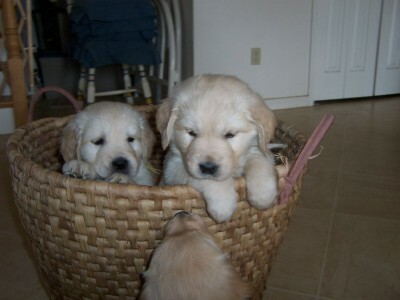 Our goal is to breed well socialized, healthy, beautiful English type Golden Retrievers. But most important... to provide you with a wonderful companion! Michèle Tuominen, from ﻿Blackpool kennels ﻿has been our mentor from the beginning of our Golden journey. It was from her that we have come to appreciate and love the English-type Golden retriever. Michèle has encouraged us all the way, helping with selecting our breeding stock. Falaise came to us from Blackpool kennel and we still have many females related to her in our breeding program. Michèle is a wonderful source of information on everything Golden. Jane Lalande from Youngcountry Goldens is also someone we consider as a mentor. She has helped us pursue in our quest for knowledge of the ideal golden retriever. We aspire to produce sound, healthy and beautiful Golden Retrievers. Temperament is of the utmost importance to us. What does Tibsen stand for? It simply is our last name spelt backwards...Nesbitt with only one t ! We are Tim and Lise Nesbitt. Dogs have always been part of our lives. Almost 20 years ago, we realized that we needed to do some research before we purchased our next family dog. We wanted to find a breed that was gentle, patient, friendly and confident. Temperament and health were the most important elements on our list. There is nothing more devastating than to purchase a dog of poor health and/or of poor temperament! So our search led us to the Golden Retriever. Then we needed to find the best kennel. After a whole year of talking to different breeders, we embarked on our wonderful Golden retriever adventure! We highly recommend taking your time choosing where your puppy will come from !